The best business in the world doesn’t exist for long if the profits can’t sustain it’s activity. So, PROFIT is the elusive goal. It makes all other things possible. Key drivers of profit are simple – total costs and total sales. Total sales can be broken down – the cost of getting the sales in (efficiency), the sum total of the revenue that’s collected (value). 1. How efficient is your sales process? 2. How much value are you giving to your customers and prospects? Important questions…they deserve some considerations. Especially if you’re not getting the sales, profits and turnover you want from your business. 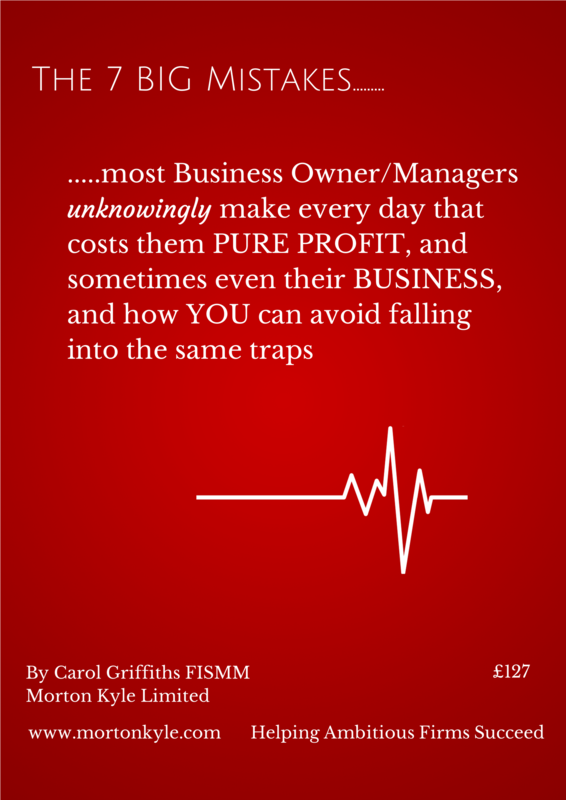 If you want further insight into why your profits should be higher – download this FREE report – The 7 Big Mistakes Business Owners UNWITTINGLY Make….that cost them profits and sometimes even their business. It’s free. Just click the link and you’ll get your copy immediately. It’ll be sent to your inbox. You’re ready for the challenge aren’t you?